It is not difficult to whiten false teeth provided you follow a simple procedure and use the correct products… both of which we will discuss in detail below. 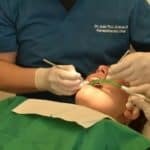 All you need is to be organized and a little patience and before you know it, the procedure will become second nature and you will see some great results. 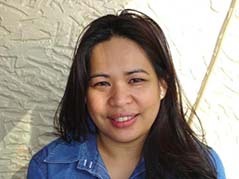 The extra effort required is a small price to pay to be able to confidently display your pearly whites for all to see. Having a vibrant smile filled with clean, white dentures can also boost your self-confidence. Plus, since you can actually remove false teeth to clean them, you can reach places that are otherwise hard to get at with natural teeth. 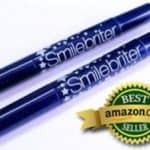 This ensures a better, more complete cleaning and makes whitening even easier to do. In fact, the most effective way to whiten dentures involves only four basic steps. So how can you remove stains and whiten false teeth safely and effectively at home? As obvious as it may sound, before you begin the whitening process, your dentures need to be properly cleaned first. All you really need to do in this first step is to clean your false teeth as you ordinarily would before wearing them for the day or after a day of wearing them. 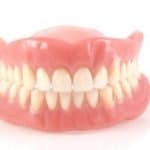 The best way to clean your false teeth is to use soap and water or a denture cleaning paste that is specially formulated for use with dentures. To brush them, use either a soft bristled brush or a denture brush that is designed specifically for this purpose. Do not use a regular toothpaste or toothbrush to clean your false teeth. The compounds found in toothpaste are too abrasive and may damage your false teeth. The same thing goes for normal toothbrushes. As dentures are a softer material than natural teeth, they can scratch easily. When you clean your dentures, be sure to do so over a sink that is either filled with water or lined with a thick towel. This will reduce the possibility of damage should the false teeth slip out of your hands and drop into the sink. >> What’s The Best Ways To Clean Dentures? The best product for whitening your false teeth is with this brush that is recommended by dental professionals as being safe enough to use daily. The GUM brush is unique in that it has two differently configured heads – one is flat with strong flat bristles and the other has a strong tufted head with tapered bristles to reach into hard to clean areas. The design of this product includes an ergonomic handle which is textured for strong gripping. For more information on the Butler GUM Denture Brush, click here. Made with a low abrasive formula, Polident Dentu-Creme will clean false teeth without scratching them. The cleaning formula removes plaque, stains and kills odor-causing bacteria. The paste also contains ingredients that leave a fresh, minty feeling and a pleasant scent. This product is also recommended by dentists for use in the cleaning of false teeth and for promoting good oral health. For more information on Polident Dentu-Creme, click here. The second step to remove stains and whiten your dentures is to soak your false teeth in a denture cleaner. These products are available at your favorite drugstore or online and should not be used until after you have given your false teeth a proper scrubbing. The reason for this is that the cleaner the surface, the better results you will receive from the denture cleaner. It is also important to note that an overnight soak in denture cleaning solution should not be done more than once a week. If you use a cleaning solution more frequently, your false teeth risk bleaching out. 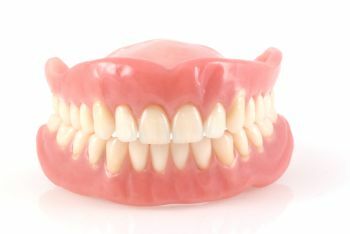 >> What Is The Best Way To Store Dentures? The most effective way to get real looking false teeth is with this fast-acting denture cleanser. It will whiten and brighten false teeth in five minutes killing odor-causing germs and leaving your dentures with a minty-fresh taste. This effervescent powder can be used daily and is recommended for use with full dentures. The manufacturer states this professional strength denture cleaner powder is three times more powerful than tablets, so will have your dentures looking like new in no time. For more information on the StainAway Plus Denture Cleanser product, click here. These tablets are considered the “most effective and safest solution” on the market to remove stains from dentures. The formula contained in each tablet kills germs and bacteria that can form into plaque or tartar. It also fights bad breath and odor. Dental Duty Denture Cleaner is also effective when used to clean wire appliances, removable bridges, and other orthodontic appliances. All you have to do it drop one tablet into warm tap water and soak your false teeth (or other dental work) for 15-minutes. 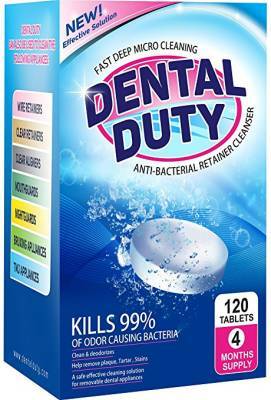 For more information on the Dental Duty Denture Cleaner product, click here. 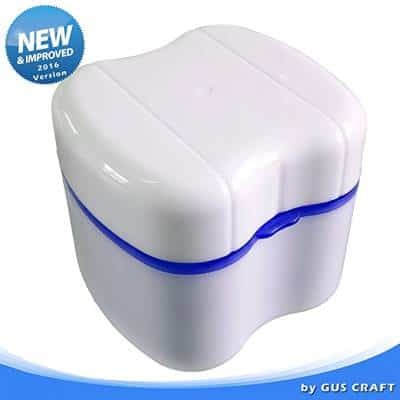 Designed to provide a safe and clean storage space for your false teeth, this denture box has an attractive appearance. It also features a detachable rinsing basket allowing for easy dry drip following a cleaning soak. The bottom of the box will collect the drippings for later disposal. There are also various color combinations to choose from and these boxes are made from FDA approved, food grade, non-toxic material. You can also use one to store more than just dentures including jewelry and this product comes with a risk-free satisfaction guarantee. For more information on this Strong Denture Box product, click here. 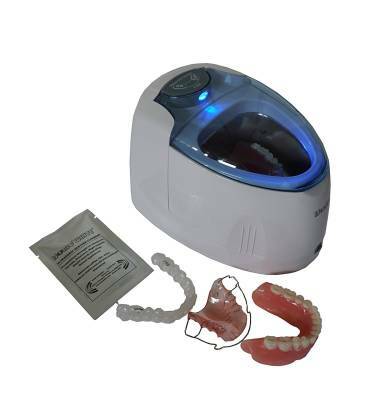 The third step in the process of whitening your false teeth involves the use of an ultrasonic denture cleaner. These devices are considered the absolute best method available to whiten your dentures. An ultrasonic cleaner is an apparatus where you soak your dentures and they get cleaned by ultrasonics. The use of ultrasonics improves the cleaning first done with a stiff nail brush as it can remove microscopic food particles from places even the finest brush cannot access. An ultrasonic denture cleaner works by emitting high-frequency vibrations that loosen the finest food particles from the hardest to reach locations. The answer to the question can you whiten false teeth is yes with this handy device. Using sound waves that penetrate deep into small spaces to remove even smaller particles, this product does the best job ever of whitening your dentures. Featuring an easy to clean stainless steel tank and a cycle that performs a five-minute cleaning and you have one of the most superior cleaners available. To see more information on the iSonic F3900 Ultrasonic Cleaner for Dentures, click here. This denture cleaning powder, when mixed with tap water (1 teaspoon to 1 cup) is designed to remove even the toughest stains and buildup in up to 15 minutes. The iSonic cleaner also disinfects as it cleans killing germs and bacteria. The manufacturer states that iSonic is “much more effective than tablets” as well as “most other denture cleaners on the market.” A single bottle can be used to mix up to 48 cups of solution and is safe enough to use on a daily basis. To see more information on the iSonic Ultrasonic Denture Cleaning Powder, click here. The final step to whitening dentures is to bleach your dentures. The correct way to whiten false teeth is to use a diluted solution of household bleach. This is the riskiest step of the four simply because it is easy to damage dental work if the bleach dilution is not correct. The bleaching steps need to be strictly followed in order to prevent damage. Dilute the bleach with water so that it is no stronger than 5%. Dentures should not soak any longer than fifteen minutes. After soaking, slowly fill the cup with water and allow it to overflow, washing out the bleach mixture, which should take about a minute. Follow this with two minutes of gentle scrubbing with a nail brush for each denture. After you have done this, place the dentures in a cup of plain cold water and soak for an additional hour. This is intended to properly remove the bleach solution which would have been soaked into the material of the dental work. Skipping this step can result in burning of the gums and mouth the next time you wear the dentures. Once again, special care has to be taken when using bleach. The other steps mentioned here should produce good results, so only try this if absolutely required. As already mentioned, using bleach to whiten false teeth is effective but you must be careful with the mixture and time your false teeth are soaking in the solution. Other home remedies include the use of such household items as vinegar and baking soda. While these are great temporary solutions, it is important to understand that neither vinegar or baking soda is as effective in killing microorganisms which are what you are trying to eliminate. Besides the cleaners and soaking solutions mentioned above, there are other soaking products that promote themselves as denture whiteners as well as cleansers. One example is Sparkle-Dent. This highly concentrated solution works right away to remove stains without scrubbing. It is also effective in removing tartar and plaque. Just add the solution to water, as directed, and soak dentures for 15 minutes. This product is safe for use with all dentures, including those with soft liners. It is also safe to use daily if desired. The 8-ounce bottle will last up to six months under normal use. 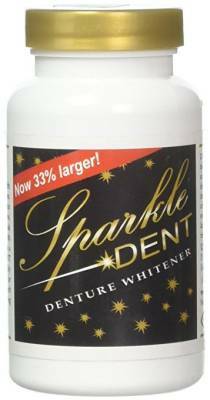 To see more information on Sparkle-Dent, click here. This common household product not only cleans dentures but it also deodorizes them as well. As for home remedies, baking soda is probably the most commonly used as it works and it is affordable. When made into a cleaning solution, this provides a gentle scrubbing action on the dentures which removes stains, bacteria, and food particles. Another relatively easy solution to find is hydrogen peroxide. It is available in pharmacies and grocery stores. All you have to do is gently rub the solution on your dentures by hand. Natural abrasive particles are found in this solution that will scrub away stains and tartar from false teeth. By soaking dentures in a solution of white vinegar and water you can clean and deodorize them overnight. Vinegar is another easy-to-find product in kitchens and grocery stores. The compounds found in vinegar will kill some of the bacteria and with regular brushing in the morning, it can help to remove stains and food particles. Because salt can be used as a bleaching agent, it is an effective tool in whitening false teeth. The best way to apply it is by dabbing a denture brush in some salt and brushing gently onto the surface of the denture. You can also use salt as an overnight soak by making a mixture of one tablespoon to a single glass of warm water. The bleaching agents in lemon juice make this another handy denture whitener. Plus, it is also easy to find at home or in the grocery store. All you have to do is juice a lemon into a cup of warm water and soak dentures for no longer than 30-minutes. If you soak them longer, you may actually damage false teeth as lemon juice also has an erosive effect. If you are not confident enough to whiten your teeth at home using any of the methods described above, you still have options. Your dentist can perform a professional whitening on your false teeth for you. But bear in mind, this will be an expensive solution, but the results will be great. The other alternative is also going to cost you considerably more than any of the home remedies listed. However, it will give you shiny looking false teeth. This option is to get a new set of dentures made. Depending on how long you have been wearing yours, you may be due for a new set anyway. If your goal is to have the brightest and whitest smile, there are several products available to assist with this. Having a clean and white smile is especially important to denture wearers but you must be careful when you attempt to clean or whiten false teeth. By following the steps outlined above and trying several of the additional cleaning options listed you will be able to find the perfect whitening solution for your dentures. 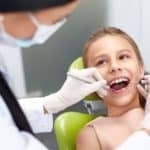 They are all effective but care has to be taken… since false teeth are made from acrylic and can be damaged in many ways, you must follow the steps outlined here instead of taking shortcuts. This is why you must take special care when handling dentures and even more precautions during the whitening process. By taking good care of your false teeth, they will not only keep looking good and keep your smile bright, you can also improve your oral health. For daily denture cleaning, you can use tap water. However, this will not remove stains as well. For the best clean, follow the manufacturer’s advice. This usually involves using denture cleaning tablets, solution or powder, which is more effective in removing stains and buildup. A cleaning powder that you may want to check out is this one.